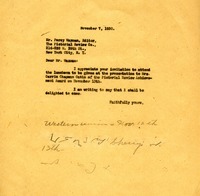 Fosdick asks Berry to join in signing a petition to the American Delegation in London in protest of abandoning a policy of reducing naval strength stated in President Hoover's Armistice Day speech. 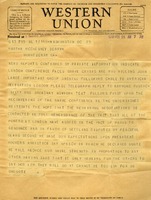 Berry's reply, added to the telegram, is that she will sign. 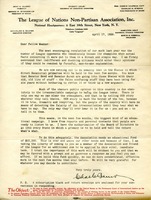 Berry has sent Neal a letter from Mrs. Pennybacker, with information that Carrie Chapman Catt is also in the field for the Pictorial Review award. Berry asks Neal if she will be able to see the people at the Pictorial Review for her. The League of Nations Non-Partisan Association seeks subscriptions for its upcoming educational campaign from members.